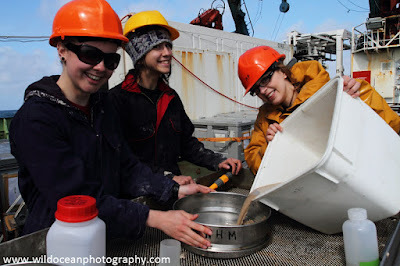 We've been busily working away out here over the past few days, getting well stuck into our nights of mud-sampling while bobbing around in the tail end of a tropical storm. 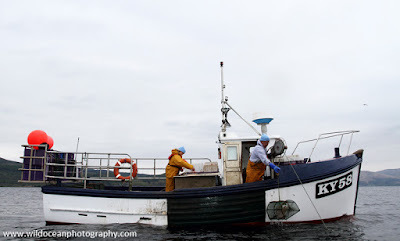 The rough weather has made it too difficult to do much willdife-watching, but it has given me a bit of extra time to work on a photo project I've been adding to for a few years now but never quite got round to finishing that I'm provisionally calling "Days at Sea". 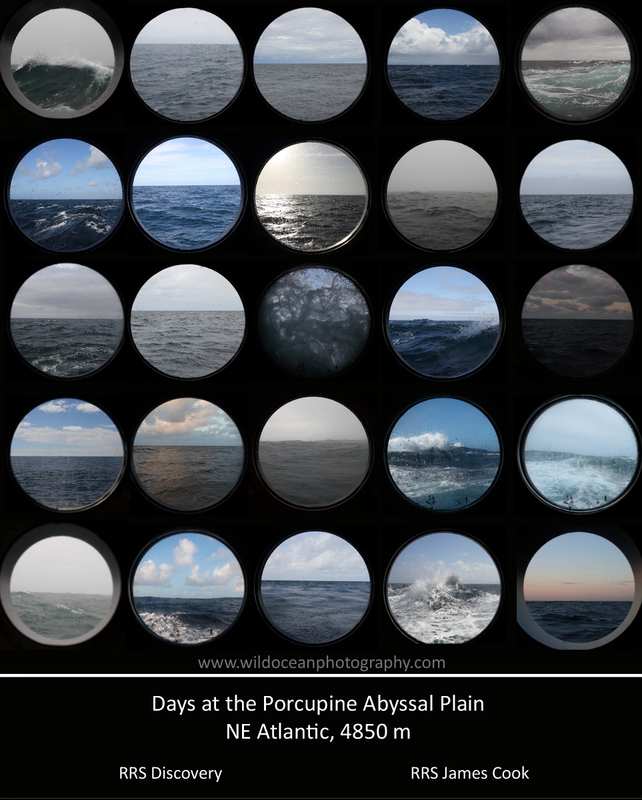 25 days on the Atlantic Ocean. Click to view a larger version. When I went on my first deep-sea research cruise, I took a photo out of my cabin window every day. At the time, it was largely just a nice way to track the number of days we'd been out on the water (and how many we had left! ), and it very quickly turned into a bit of a habit which has turned into a rather large archive of images. Out here, there is virtually nothing out here to see except and endless expanse of sea and sky, but for such a simple view it's amazing how variable it can be from hour to hour and day to day. This project is intended to be a reflection of the dynamic and relentless beauty of our oceans. Last night we were joined by a family group of pilot whales just as we were finishing dinner and preparing ourselves for our first night of seafloor sampling. Incidentally, running up and down two flights of stairs to get your camera after eating a large amount of lasagne and banana bread (separately, not at once!) is not an entirely pleasant experience! A large pod of pilot whales popped by the ship yesterday. 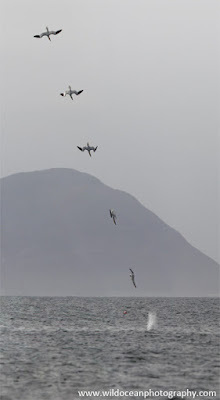 Pilot whales are funny beasts. They have a very lazy way of rolling through the water, which makes them a bit difficult to take interesting photographs of because they don't do much other than breathe and pootle about. The calves tend to be a lot more active and tend to leap around a bit more which is VERY cute to see if you can find a family group! 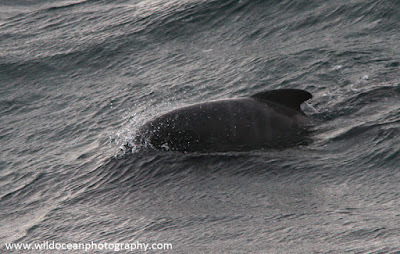 This pod had a couple of calves with them that still had visible foetal bands, meaning they must have been pretty new! 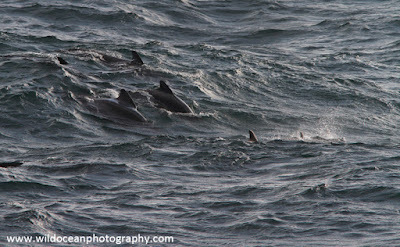 We got really lucky with this group, and they stayed near the ship for about two hours. 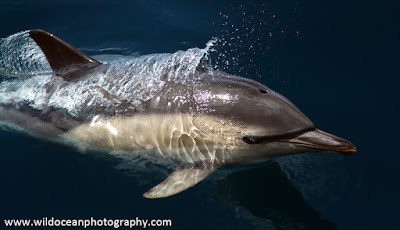 Most of the photos I took were of small black fins in the distance (as is typical of photographing whales and dolphins), but they did briefly come right up close to us and I got a few photos that were a bit more reasonable! 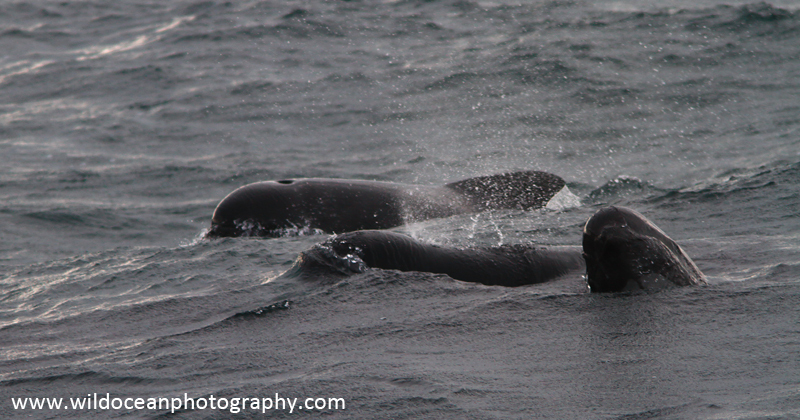 This pilot whale calf was so young the foetal bands were still visible on its flanks. 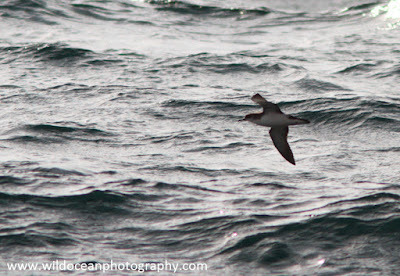 We've also been seeing a few shearwaters over the past couple of days. I'm not completely sure what species of they are, but I suspect they're Cory's shearwaters, though that's based mostly on the fact that I've seen them out here before and these ones look a bit similar. If anyone with a better internet connection than me can check and let me know it'd be much appreciated! 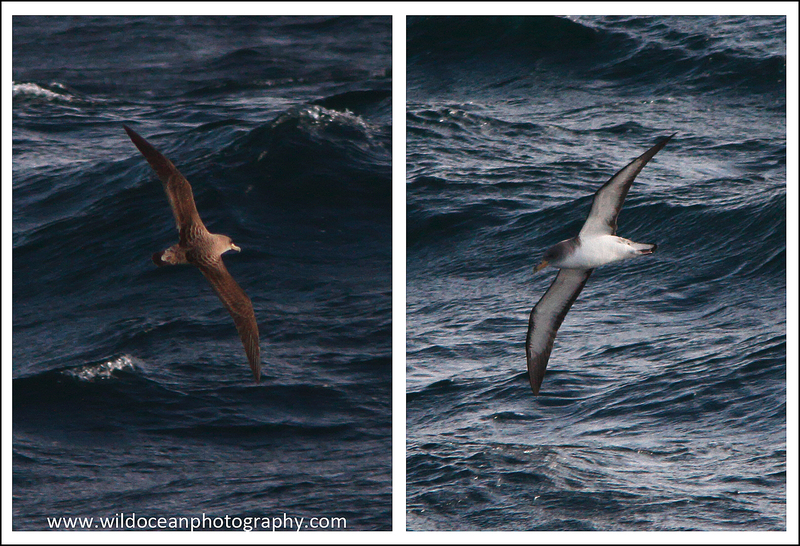 I think this is a Cory's Shearwater... Is that right? Anyway, we've been put on night duty for our mud-coring work so I'm going to try and grab a couple of hours of sleep before dinner. See you next time! 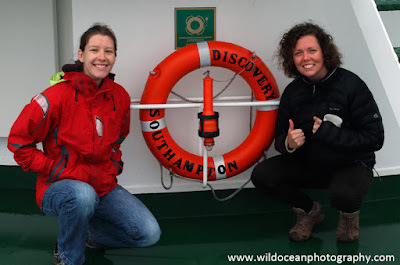 As I mentioned in the last blog, we had to spend a couple of days travelling from Liverpool to Falmouth at the start of our cruise so that we could fix a problem with the ship (which went smoothly) and then transfer our remaining scientists on board ready to get to work. Because our research site is 300 km offshore, we tend not to see too much in terms of wildlife once we get over deep water so the extra time spent off the Welsh coast provided some nice opportunities for wildlife-spotting! 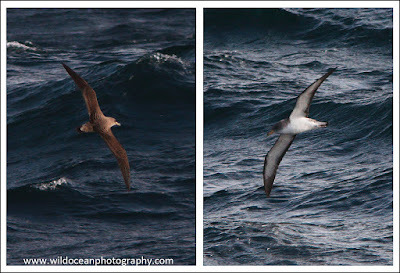 We had really nice sightings of most of the usual suspects: kittiwakes, gulls, gannets and fulmars were the most common birds, as you'd expect really, but because we were a little further offshore we also had a few sightings of Manx shearwaters which was really nice. Shearwaters and petrels live almost entirely at sea (usually quite far offshore), and only come to shore to breed in burrows (a bit like puffins). Unfortunately, when they come ashore they're also nocturnal, which means your chances of seeing them are pretty small most of the time. I can't pretend I got any decent photos of them, but they are always nice to see! 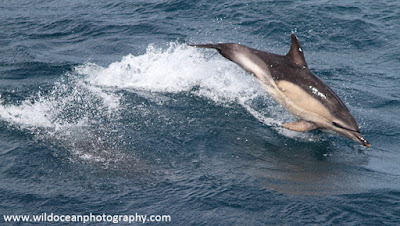 We were also joined by a small pod of common dolphins en route, which looked like they had a calf or two with them. They didn't stay with us for too long, but they were bouncing around enough to grab a few shots! I've never had a great deal of luck photographing these guys because they move around so fast, but I'm pretty pleased with how these photos came out. Oh - and we also briefly had a couple of stowaways with us too! They seem to have left us at Falmouth though so we won't be adopting them as cruise mascots! 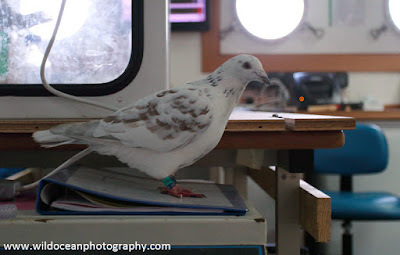 A couple of racing pigeons briefly stowed away with us for a trip to Falmouth. It's nice to be back at sea! Last Friday, I left Glasgow with one of my fish-ecologist colleagues to join the RRS Discovery for another cruise to the Porcupine Abyssal Plain (PAP) long-term survey site. This is my fourth trip out to the PAP in as many years now, and I must admit it's really nice to be back on a ship! Me and Jo, ready to sail! The main purpose of this particular cruise is to service the PAP monitoring buoy and download the data that it's been collecting for the past year. 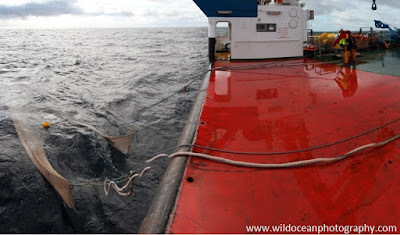 This includes oceanographic data (e.g. 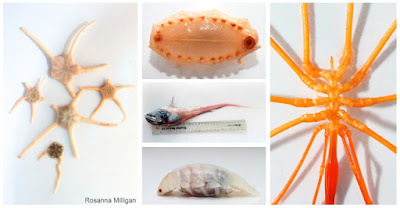 current speed, water temperature, salinity), as well as collections of the sinking particles of dead organisms, biological waste and other organic and inorganic materials that make up the "marine snow" which fuels the vast majority of deep-sea ecosystems. 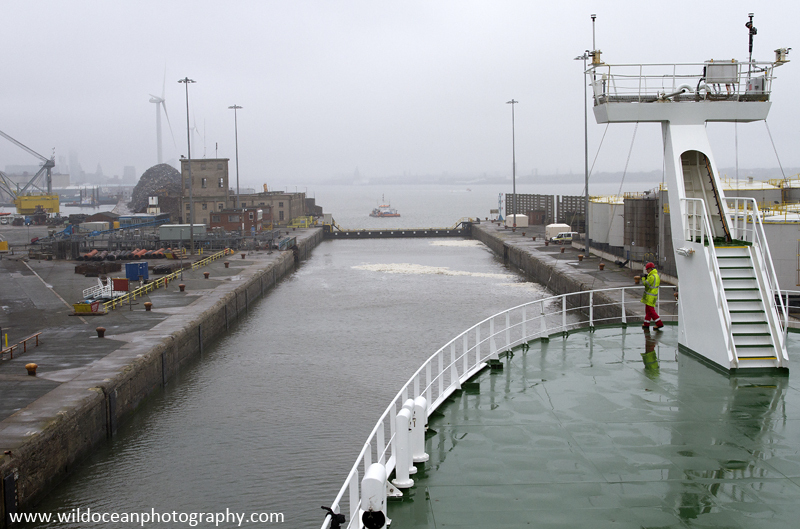 Taking a ship 300 miles offshore is not a simple (or cheap!) task however, and there's no point coming all the way out here just to service a buoy and go home again so we've got a full contingent of scientists ready to make the most of the opportunity to collect their own data from the PAP site. 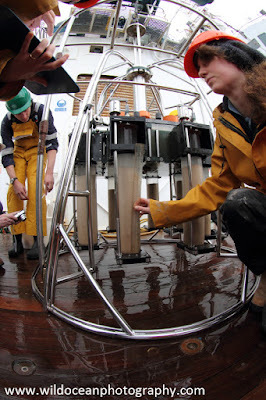 On this particular cruise, we've got teams who are interested in understanding how mid-water bacterial processes and communities are influenced by "marine snow" particles, as well as researchers who will be studying the plankton communities and oceanography of the site. We even have a couple of holographic cameras which can automatically assess the sizes of all the particles in a tiny patch of seawater and rebuild an image of them all! Some photos from the last time I was out here to fish in the abyss. Hopefully this time we'll catch even more! 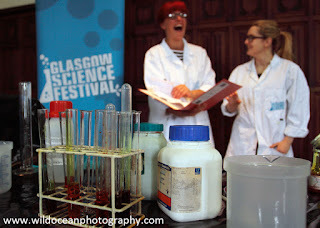 As exciting as the midwater research is though, I am here with Jo Clarke from Glasgow University to go fishing! We're working with the "benthic" (seafloor) ecologists from NOC to help collect deep-water animals from the seabed using mud cores, grabs and a trawl. 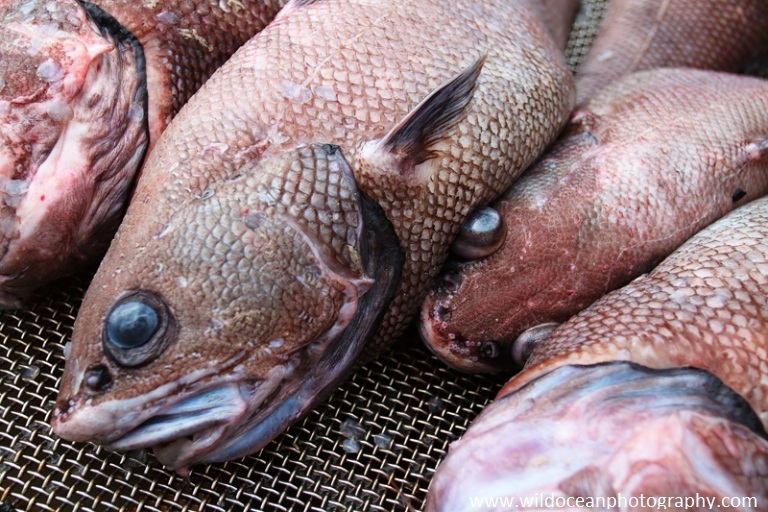 We're really here for the fish, so we're mainly interested in the fish samples, and are here to make sure that they get identified, processed and recorded correctly for any future work that might be done on them. We'll also be helping out with all the other benthic sampling that needs to be done which will largely involve dealing with a lot of mud! 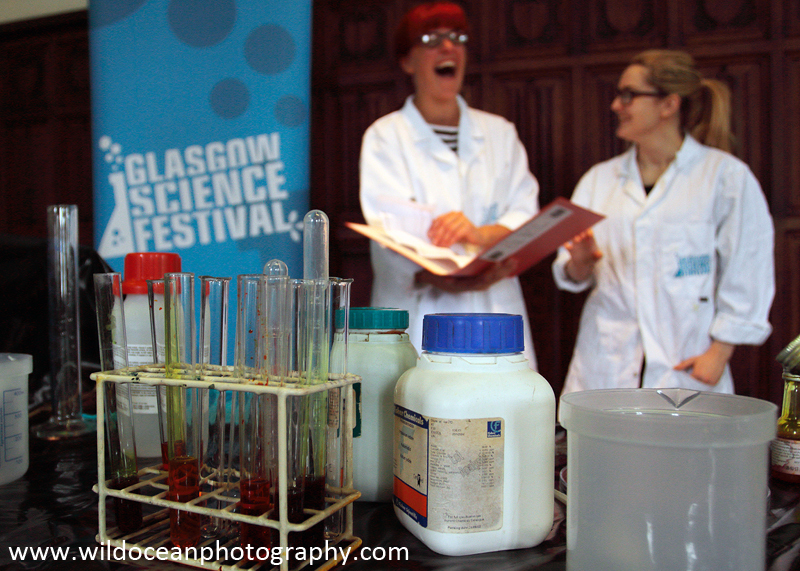 Sieving mud samples isn't so bad really! 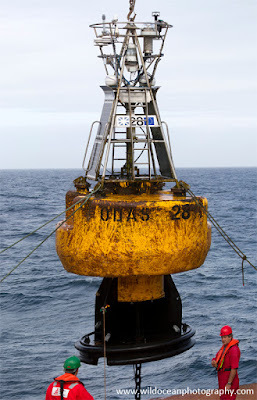 The megacorer is one of the standard sampling gears for getting good quality sediment and animal samples back from the seabed. We'll be seeing a lot of it over the next few days! So far we've had a pretty quiet start to the cruise. We met the ship in Liverpool and then spent a couple of days steaming south to Falmouth so some repairs could be done to one of the ship's thrusters while we were still near the coast. Happily that all went well, and we reached Falmouth just after midnight on Sunday for a mini crew-swap before starting our voyage to the PAP site. We should arrive there tomorrow, ready to start working! 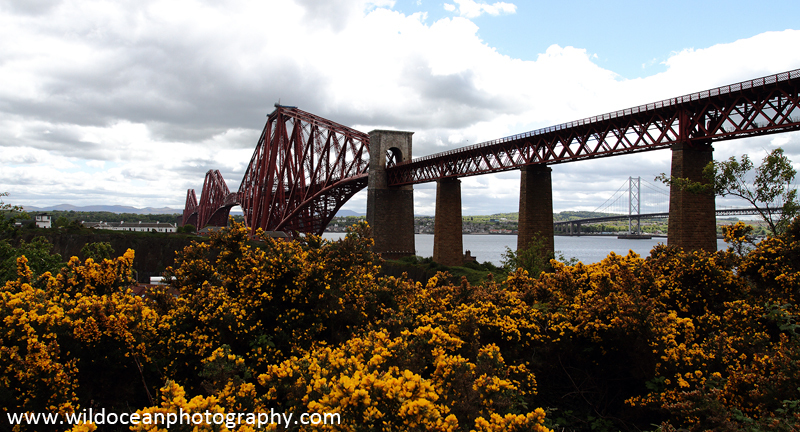 The Forth Rail (and road) bridge at North Queensferry, as seen from Carlingnose Reserve. 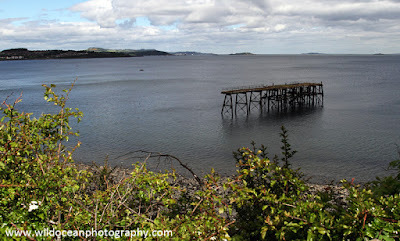 North Queensferry is probably best known for their stunning views of the Forth Rail Bridge, and possibly for the Deep Sea World aquarium (if you haven't been, it's VERY cool!) However, the Scottish Wildlife Trust also run a lovely little reserve at Carlingnose Point with views looking west over the Firth of Forth. ... If you can find it that is! We parked at a car park underneath the rail bridge, found a sign showing that we were not only in the right place, but a mere stone's throw away from the reserve. It then took us about an hour of wandering the town and scrambling unnecessarily over the boulder shore before we admitted defeat, went back to town and managed to find the path leading to it. There was a lot of really interesting dried out pieces of driftwood along the shore. Top tip: if you ever arrive looking for the reserve yourself, there are no signs in the town, but you'll find it if you follow the signs for the Fife Coastal Path and head away from the town (or away from the grey road bridge if that's easier). Look for the Fife Coastal Path and follow it west. There are no signs for the Carlingnose Point Reserve in town that I could find. The reserve itself is in place to protect locally rare populations of wildflowers and plants, and the dense scrub provides a nice habitat for smaller birds as well but it's also a nice viewpoint to look for seabirds on the shore. 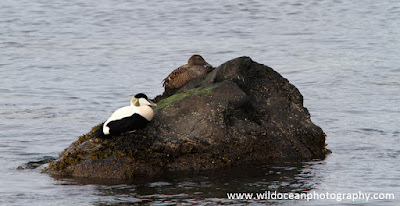 We visited in May and only saw a couple of eider ducks, but it was a really sunny day and it's possible that the birds had all finished foraging early in the morning and headed away to roost by the time we arrived. 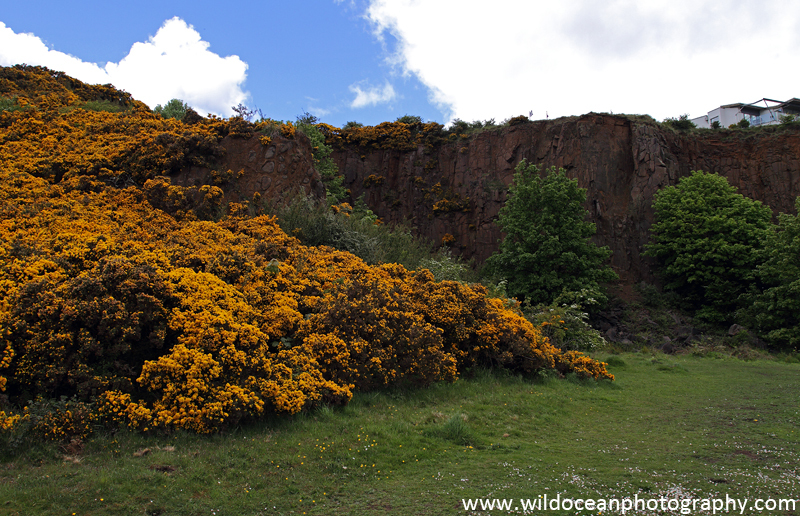 The reserve was small and pretty quiet on the day we visited, but the vast fields of gorse were stunning! 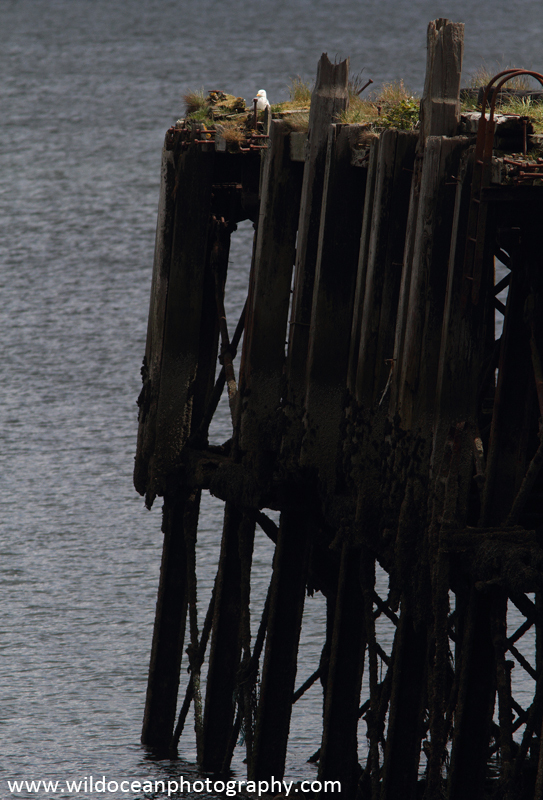 There's an old ruined pier just offshore that had a sleeping gull on it, but the wildlife was keeping fairly quiet on the day we visited. 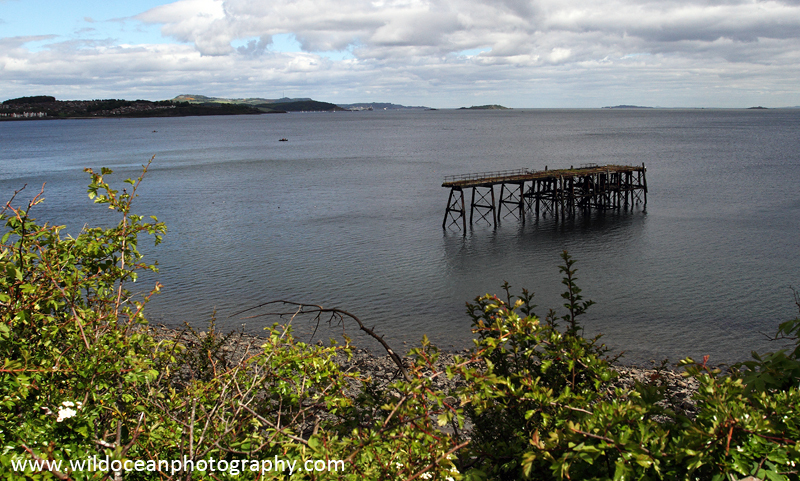 An old ruined pier lies just offshore off the reserve. Sunny afternoons are perfect for napping, no matter what species you are! 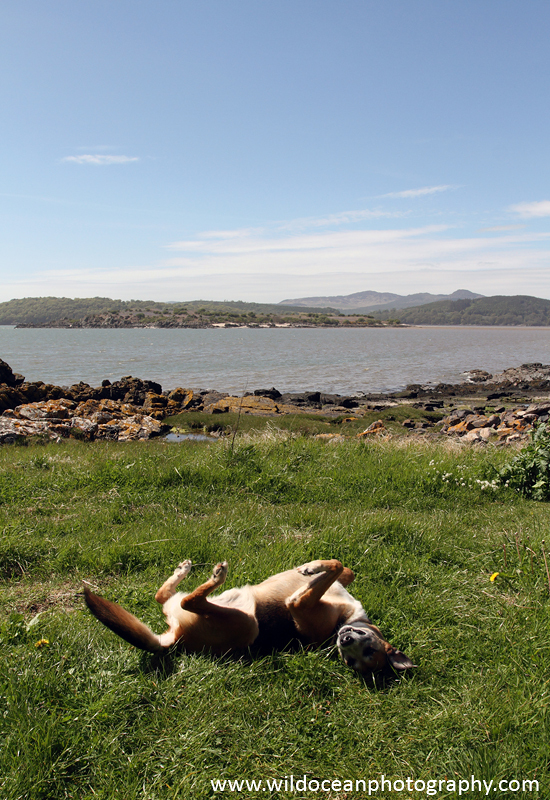 The reserve itself is pretty small, but if you follow the Fife Coastal Path, you'll be led down to a big sandy bay where you get some lovely views over the Firth of Forth. 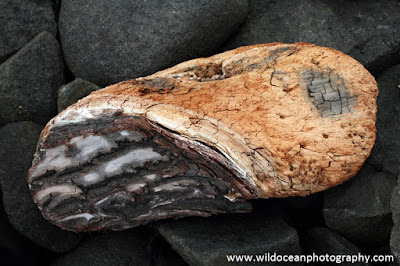 Following the coastal path brings you to this beach which was covered in oyster shells. 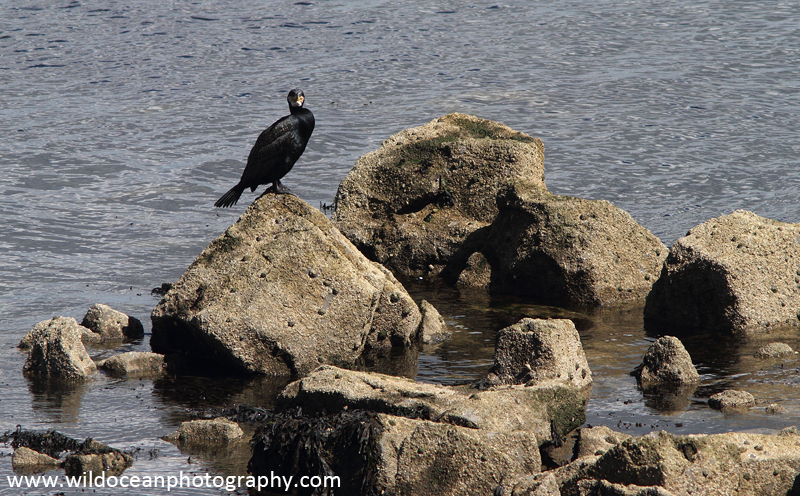 A group of cormorants were out enjoying the sun on the edge of the shore too. The beach was also covered in oyster shells, which is pretty unusual and the first time I can remember seeing any - especially in such large numbers! 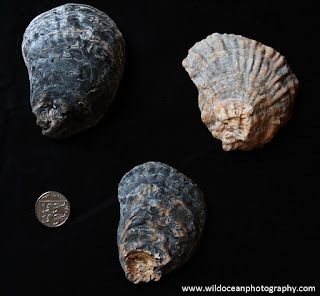 Shells from what I think might be native oysters (Ostrea edulis). I included a 10 pence coin for scale, which has a diameter of roughly 25 mm. I suspect they're possibly native oysters (Ostrea edulis), but I'm not an expert on these animals. If anyone knows what these are, it'd be really interesting to know. North Queensferry and the road and rail bridges over the Firth of Forth. Back in the town, you will of course be treated to some stunning views of the road and rail bridges, but the town itself is beautiful and quite typical of a coastal Fife town so it's well worth saving a little time to look around the town and its harbour before you leave. It's sometimes also possible to see dolphins in the tidal races underneath the rail bridge, so they're worth looking out for too! The new road bridge being constructed. 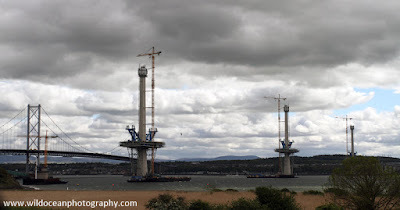 This year (2015), they're also in the process of building a new bridge over the river and it's pretty cool just to see the scale of the engineering works that are happening just now. The rocky shores at Rockcliffe (low tide). 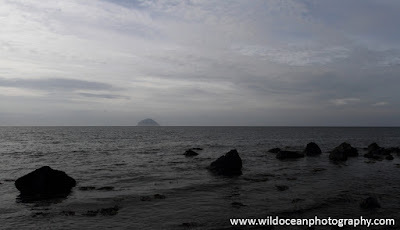 I went for a bit of an explore around the Solway and Ayrshire Coasts a couple of weeks ago to find some new places to make longer visits to in the future. 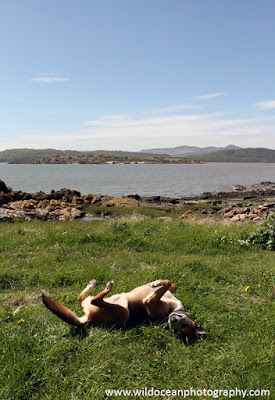 So, with the dog and my mum in tow, we headed south and started our wanderings at the descriptively-named town of Rockcliffe (which is indeed both rocky and cliffy). From here, there's a coastal walk along a very nice rocky shore and out along the sea-cliffs to the sandy bay at Sandyhills (where there is sand and hills!). 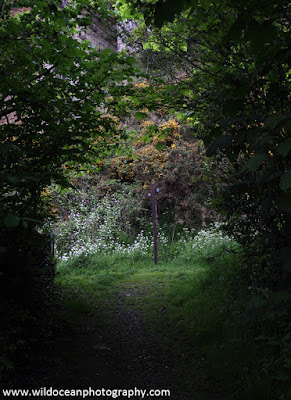 The walk itself is about 4.5 miles in each direction, and there is an infrequent bus service that will take you from Sandyhills back to Rockcliffe if you'd prefer not to retrace your steps. The towns of Rockcliffe and Sandyhills are connected by a lovely coastal walk along the sea cliffs. There's an easy path that meanders just above the top of the shore if you prefer not to scramble around on the rocks. 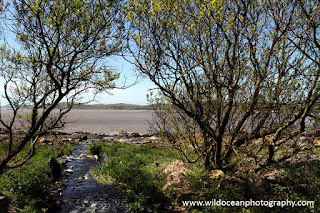 The shore around Rockcliffe is volcanic and rocky, with loads of wild plants and a small stretch of woodland running along the at the top of the shore and decent rockpools over the shore itself. Beyond the rocky shore, the coast extends out onto a large mudflat. 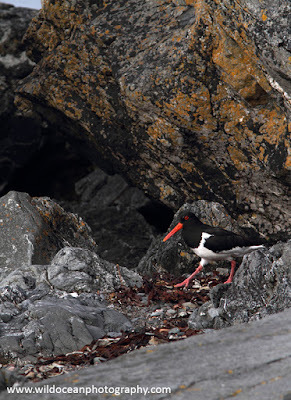 We didn't see too much in the way of seabirds over the flats, although there were a few of the usual oystercatchers and gulls foraging on the edge of the water as the tide came back in. One of the problems I find with sunny days in the summer though is that most animals get up at the crack of dawn, feed early and then chill out for the rest of the day, so it may just have been bad timing on our part! 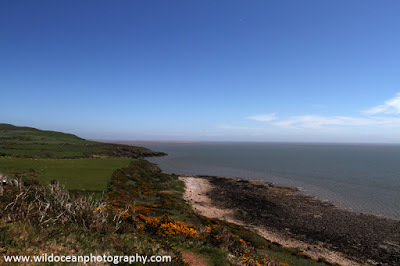 Looking up the coast from Castle Point. The path follows the cliffs east to a big sandy bay at Sandyhills. 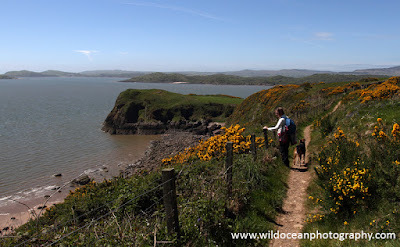 The path takes you through the edge of the town, past a smuggler's grave and up to Castle Point, which is where the main cliff walk begins. The view to Sandyhills. This was as close as we got on this occasion! 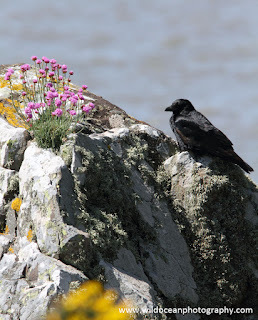 I was hoping there might be a few seabirds nesting on the cliffs, but there weren't really any to be found the day we visited. 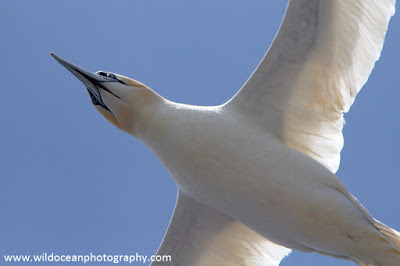 A couple of gulls flew past us but there certainly wasn't too much to see in terms of seabirds when we were there! 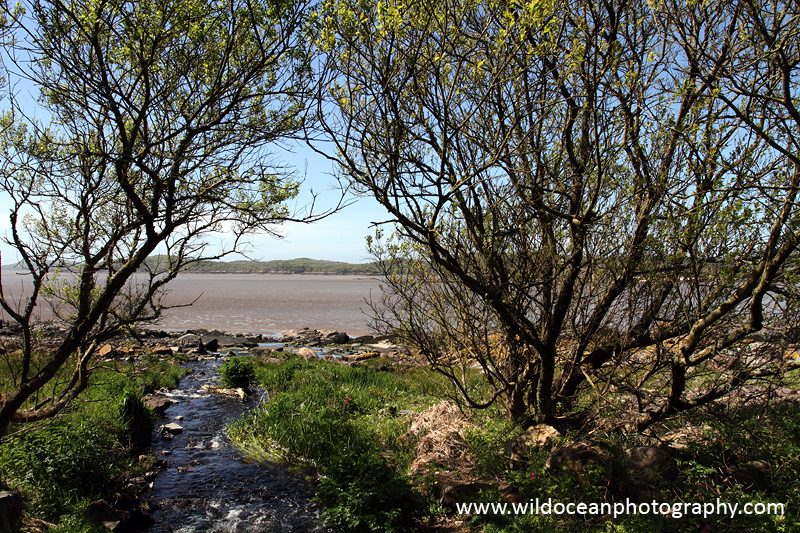 Saying that, the views along the coast were stunning and the shores around Rockcliffe are beautiful for exploring. We unfortunately weren't able to follow the path all the way to Sandyhills on this particular trip because the dog got too excited about life and cut his foot rather badly on the beach. Not that he noticed or cared particularly (and he's completely fine now! ), but we did have to curtail our wanderings and pop him back in the car! A hooded crow on the shore.